Two men have been arraigned in the case of a missing Hofstra graduate from Stamford, Connecticut who prosecutors say was stabbed 15 times in the chest in a luxury Manhattan apartment and then buried in a shallow grave in New Jersey. James Rackover, 25, and Lawrence Dilione, 28, were held on $3 million bond or $300,000 cash bail after their arraignment Thursday on charges of concealment of a corpse, tampering with evidence and hindering prosecution. Police had arrested both men on second-degree murder charges in the death of Joey Comunale, but prosecutors did not bring that charge against them in a criminal complaint. Nonetheless, during the hearing, Assistant District Attorney Antoinette Carter alleged that "one or both of these people committed a murder." Police said the 26-year-old Comunale appears to have been stabbed to death in some sort of dispute after he, Rackover, Dilione, and three women returned from the Gilded Lily nightclub on 14th Street late Saturday or early Sunday. Two men were charged in the murder of a Hofstra graduate. They were arraigned overnight and were waiting to post bail. Kerry Barrett reports. One official said that Comunale was stabbed sometime after the three women left Rackover’s apartment, but police aren't sure how the body was removed from the apartment. According to a criminal complaint, an informant told authorities Rackover was seen late Saturday leaving his apartment building and putting a large duffel bag into the trunk of a black Mercedes with tinted windows that was registered to Rackover's father. Records show the car leaving Manhattan and traveling through the Holland Tunnel to New Jersey, the criminal complaint says. On Wednesday, after Dilione allegedly admitted he and Rackover dumped Comunale's body, detectives found the young man's remains in a shallow grave in Monmouth County's Oceanport, behind an old police stationhouse. Comunale had been stabbed more than a dozen times in the chest; his legs were burned and a gas canister was discovered nearby, the criminal complaint says. Bloody clothing, sheets and towels were found in Rackover's apartment during the course of an investigation, prosecutors said. The black vehicle that Rackover had been seen driving was later returned to Manhattan, left in a parking garage on East 58th Street, and a cadaver dog made a positive alert for a body or bodily fluids in the trunk area, the complaint says. "I look forward to what our review of the evidence will reveal," Rackover’s attorney said after his client was arraigned Thursday night. Dilione's attorney, Daniel Parker, couldn't immediately be reached for comment. Authorities charged two men with murder in the case of a missing Hofstra graduate from Stamford, Connecticut, who was stabbed 15 times in the chest in a luxury Manhattan apartment and then buried in a shallow grave in New Jersey. Ray Villeda reports. Court records shows that Beaudoin changed his last name to Rackover in 2015 after he was taken under the wing of jeweler-to-the-stars Jeffery Rackover, who owns Jeffrey Rackover Diamonds on Fifth Avenue. The two met in 2013 and became so close that Rackover referred to Beaudoin as his son, according to former NYPD detective Bo Dietl, who is a friend of the famed jeweler. Rackover was aware of Beaudoin’s rough past and helped him get a job and an apartment in his building after meeting him, Dietl said, adding that Rackover never had kids and embraced Beaudoin as his own. He added, "He was here for this kid and now poor Jeffrey is caught in the middle." 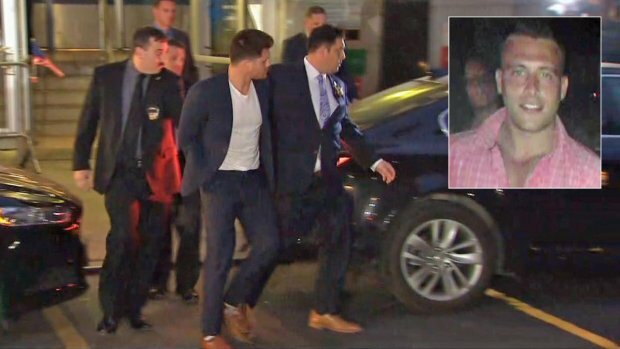 New York City detectives arrest two men they say killed 26-year-old Joey Communale in a luxury Manhattan apartment, then buried his body in a shallow grave in Oceanport, New Jersey. Marc Santia reports. Comunale graduated from Hofstra University and was an avid hockey player. "He was one of a kind," Comunale's stunned father, Pat, told reporters from his Connecticut home Wednesday. "We're just in denial. This is not something that happens to kids like this. I don't know if it was pre-meditated. I don't know how it happened." "He didn't deserve this," he added. "He didn't go looking for trouble. It wasn't right. This is not right."